Detailed review of No7 Protect & Perfect Intense Advanced Serum. See what real experts and actual users have to say about this face serum. No7 Protect & Perfect Intense Advanced Serum is a disappointing product, and sadly, fails to deliver on any of the stated claims. As an anti-aging serum, the product did nothing to decrease fine lines and wrinkles, or dark sun spots. Additionally, the serum seemed to decrease the appearance of my skin, increasing both the grease in my T-zone, and making my skin look dull at the same time. Long-term results were not experienced, and immediate results were negative. Application of this serum is simple, and was easy to work into my daily skincare routine. Simply apply the product morning and night to the face and neck area after cleansing, and follow up with a moisturizer. This serum is thicker than most face serums, and has the consistency of a face moisturizer, so your skin does feel a little caked on with product once the skincare routine is complete. This is a big downfall of the product, specifically for daytime use. At $30 for a single ounce, this is definitely not the cheapest serum on the market. Since it decreases the overall appearance of skin, and fails to deliver on any of its anti-aging claims, this serum is not worth the money. Additionally, customers are unable to purchase directly from No7, so they are at the mercy of the store they purchase the product from for return policy or money-back guarantees. 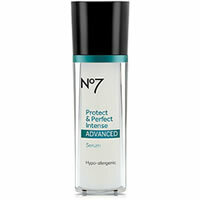 No7 Protect and Perfect Intense Advanced face serum is a clear, water-based face serum. The texture is thicker than most other face serums on the market, and feels more like a thick, Vaseline-like moisturizer than it does a serum. While it is water based, it feels more silicon based upon application, leaving your face with a greasy feeling. Applying the No7 face serum was easy, and a simple step to work into my daily skincare routine. After cleansing and toning my face, the Protect and Perfect serum should be applied to your face and neck, with a moisturizer applied after. Since the serum is very thick, it’s more difficult to work your face lotion on top of. The serum is intended to be applied both morning and night. Since I use heavier skin creams at night, this didn’t prove to be a problem. However, for daytime application, I hated using the serum and found it difficult to wear under my lighter moisturizer and makeup. The drying time for the No7 face serum is immediate. While the silicone feel made it easy to glide on to my face and neck, it also seemed to dry almost immediately, making it difficult to move the product around once it had been set. This also left my skin feeling dry overall. The smell of the No7 Protect and Perfect serum is similar to many “scentless” face and body moisturizers on the market. It smells fresh, but does not have a particular scent. Anyone who is sensitive to odors in their beauty products would not have an issue with the scent of this product, in my opinion. I first applied the product at night, and upon applying the product initially, I found that it made my skin look extremely dull. It took away any nature glow I had, and left my skin feeling dry and dirty. When I woke up the following morning, I realized that my entire nose and chin area was greasy—greasier than I have experienced with any other skincare product before. Since the product is hypo-allergenic, I didn’t expect the serum to cause me to break out or have any blemishes pop up. Luckily, this did prove to be the case. Since the serum has a thick, silicon feel to it, I found that my face felt very “caked on” with product. This didn’t bother me as much with the nighttime application, but bothered me significantly when using it in the morning. I had zero positive long term results with this product. The fine lines and wrinkles I had on my face before using this product remained the same throughout my time using it, so the anti-aging claims proved to be false for me. After using the product for weeks, I found that my skin looked dull, and gave off a very dry, tired look. On the flip side, however, I experienced an intense amount of grease in my T-zone, making it nearly impossible to comfortably wear this face serum during the daytime. I did not have any discomfort using this product, nor did I experience any acne or blemishes, so anyone with sensitive skin can use this product without risking a flare up on their face or neck. At $29.99 for a single ounce, the No7 Protect and Perfect Intense Advanced Serum falls in the middle of the price range for face serums on the market today. However, given the fact that the product does not work, and is uncomfortable to wear, I think the product is a poor investment, and not worth the money. The No7 Advanced Face Serum is hypo-allergenic, and claims to be clinically proven to be even more effective at visibly reducing deep lines and wrinkles, and producing younger looking skin in just two weeks. No7 products cannot be purchased directly from the manufacturer, however, so customers must work with Walgreens, Target, and Ulta to return the product and possibly get money back if they are unhappy with their results, or lack thereof. To purchase No7 Protect and Perfect Intense Advanced Serum, click here. Texture/Feel This is a clear, water-based serum that feels thick and silicone based. Application Easy to apply; use daily on face and neck. Follow with a moisturizer. Drying Time Dries almost immediately; leaves the skin feeling dry and dull. Smell Smells similar to face moisturizers on the market, seemingly scentless. Long Term Results Zero change in fine line and wrinkles. Dull looking and greasy skin resulted from using the product long-term.